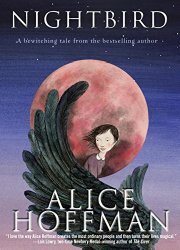 Atheneum Books for Young Readers, New York, 2015. 36 pages. One True Desire and four problems. Her One True Desire was to get a pet giraffe for her birthday. The four problems were . . .
and Grand-mamá, who was very strict. Sophia presents her case eloquently to each of these adults, with her arguments perfectly and amusingly tailored to her audiences. 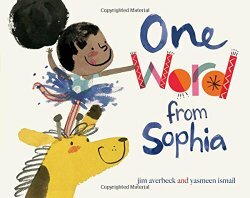 Her mother says she’s too verbose, her father that she’s too effusive, her uncle that she’s too loquacious, and Grand-mamá that she needs to get to the point. Now, I expected this book to be an example of how, sometimes, you simply can’t get the things you want. Umm, this is not that book. Also, kids won’t necessarily get the court references when Sophia makes her case to her mother the judge or the business proposal references in her presentation to her father the businessman or the polling references in the results shown to her uncle the politician. However, those are what makes the book tremendous fun for an adult reading it. And I think kids will enjoy the sounds of the words, even if they don’t grasp all the humorous implications. And I’m not completely confident that we really should give little negotiators any ideas for how to work. They’re awfully good at what they do already. And if Sophia can con her family into getting her a giraffe? Well, clearly your own little negotiator is much more reasonable. Should we give that ground to them? But this book is simply way too much fun not to recommend it, so I will be content with warning potential adult readers. In general, I suspect that the enjoyment you get from reading this book will outweigh any drawbacks from ideas your children pick up. (As if they actually need any.) And, best of all, they may remember to say Please! I should add that the pictures are delightful – portraying a mixed-race family with lovely vibrant colors. And just the right amount of words. May we all know our One True Desire as clearly as Sophia. Tor Fantasy, New York, 2014. 502 pages. This is the sort of book that usually gets me telling people I don’t particularly like fantasy written for adults — so much detail in the world-building! So many strange names and strange cultural facts! So much strangeness in names and terminology! 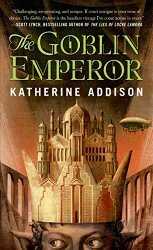 However, unlike some others which I won’t name, Katherine Addison won me over completely with her story, despite the abundant detail. I found myself completely caring about the protagonist and even about his detailed choices — which at first I’d been impatient about. Maia is the half-goblin fourth son of the elven emperor. His father is ashamed of him — he looks far too much like his goblin mother. He only met his father at his mother’s funeral, when Maia was 8 years old, and then was sent back into exile, accompanied only by a tutor who was also in exile and unhappy about that. But then the emperor and his three oldest sons are all in an airship crash. Maia must come to the capital city immediately and take the throne. This book is the story of an 18-year-old young man with no training for leadership being suddenly exalted to the position of emperor. He must learn how to rule and how to navigate the court and the halls of power. As well as wanting to stay alive. Maia doesn’t even know how to dance or ride a horse. Can he get himself crowned, investigate his father’s death, choose an empress, rule the country — and stay alive while he’s doing it? 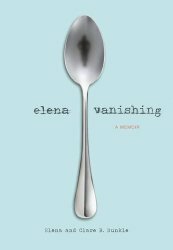 Despite my original prejudices, this ended up being an absorbing and engaging story. Source: This review is based on a book I got at ALA Annual Conference, signed by the author. It’s time for Sonderling Sunday! That time of the week when I play with language by looking at the German translation of children’s books. Sort of a Traveler’s Phrasebook for Very Silly People. 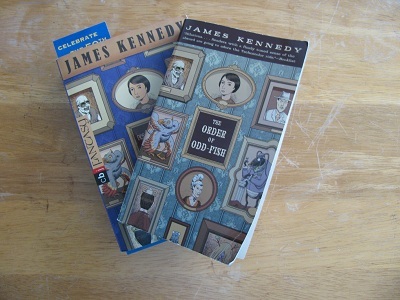 This week, I’m back to the book that inspired Sonderling Sunday, The Order of Odd-Fish, by James Kennedy, the most Sonder book of them all, Der Orden der seltsamen Sonderlinge. This is my first week back after two and a half weeks of vacation on the west coast (which was great! ), so once again I’ll have to keep it short. But there’s enough time for a little fun. Last time I left off on page 234 in the English edition, Seite 295 auf Deutsch. I am in the middle of Chapter 18. Sir Alasdair übte oben auf seinem Urk-ack. Don’t you want to know how to say this? = Tante Lily hob die Brauen. That’s all I have time for tonight! But it’s good to be back! I am häufig abgelenkt, but die Entscheidende is to get back to it! 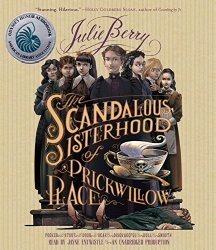 The Scandalous Sisterhood of Prickwillow Place are the students at a girls’ Victorian boarding school in Ely, England, St. Etheldreda’s School for Young Ladies. Right at the start of the book, the girls’ awful headmistress suddenly dies, as does her odious brother. The girls don’t want to be sent home! Smooth Kitty forms a plan. They will carry on as if nothing has happened. Stout Alice is an aspiring actress, so she can impersonate Mrs. Plackett when visitors come to the door. Pocked Louise is a budding scientist, so she can determine if poison was used. Dour Eleanor can be in charge of burying the bodies in the vegetable garden, and Disgraceful Mary Jane can distract any men who come around. Dear Roberta and Dull Martha have parts to play as well. There’s one problem: What will the murderer do if their plan didn’t work the first time? Will they be convinced Stout Alice is in fact Mrs. Plackett and try again to kill her? I enjoyed the atmosphere of Ely with the cathedral looming, as I have been there and that’s what I remember. What I love about it is that it reminds me of the stories my sons wrote when they were in about fourth grade. The smaller book is called Billy’s Booger and explains how Billy and his booger got bonked by a meteorite and gained super powers. 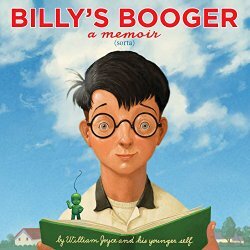 The booger became a mathematical genius, and Billy could call on it at all times. The President of the United States asked advice from Billy and his Super-Booger! Billy is tremendously disappointed when he doesn’t win any prize at all, not even honorable mention. But the librarian puts all the kids’ books in the library — and Billy’s Booger gets checked out more than any other book. Toon Graphics, 2015. 49 pages. 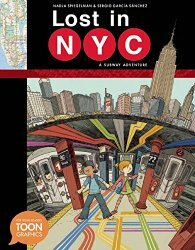 Here’s a story that makes the most of the graphic novel format and throws in plenty of facts – even historic photographs – about New York City and the subway system. Pablo’s first day of school in New York City happens to be the same day his class is going on a field trip, riding the subways, to the Empire State Building. Alicia helpfully offers to be his partner, but he is wary of making friends, since his family moves so often. With Pablo’s inexperience, Alicia and he get separated from the class, and then Pablo gets separated from Alicia. However, Pablo knows where they’re going and asks for directions. Alicia uses her knowledge of the city to walk to the Empire State Building, and the class rides the subway. The graphic novel is perfect for showing how the three different groups take three different routes. Along the way and in the back of the book, we get the history of the subway and facts about New York City. And we’re told about another nice touch at the back. When the illustrator, Sergio Garcia Sanchez, was researching in preparation for drawing pictures of the subway stations, he took lots of pictures, and then noticed a policeman keeping a wary eye on him. So on almost every spread of the book, he included himself taking pictures and being followed by a cop. And of course once the reader finds that out, you go back to spot Sergio and the Cop in every crowded subway spread. Even though this is a story about getting lost, I think the happy ending will help kids approach something potentially daunting – like riding a subway – without fear and with confidence. This is a lovely book that challenged my thinking and opened my mind. I read it a little bit at a time, then finished the last few chapters during the 2015 48-Hour Book Challenge. In a way it was a shame to finish off the end quickly, since I liked the daily dose of thinking about God in new ways. In this book, Lauren Winner looks at metaphors found in the Bible about God — but which the church doesn’t talk a lot about. Or at least the modern church. She did find writings from years past about each of the figures of speech. She looks at God as clothing, God as scent, God as bread and vine, God as a laboring woman, God as one who laughs, and God as flame. All of these metaphors are found in Scripture, and all have something to offer us today. I’ve been a church-goer all my life, and I enjoyed hearing things I hadn’t heard before. I enjoyed having a different light cast on my thinking about God. The Bible has a great deal to say about this. Your church might primarily describe God as king, or light of the world, or ruler of all. In my church, we tend to call God Father, or speak of God as shepherd or great physician. When we are really going out on a limb, we pick up Matthew and Luke’s avian image and pray to God the mother hen tending her brood. Most churches do this — hew closely to two or three favored images of God, turning to them in prayer and song and sermons. Through repetition and association, these few images can become ever richer: there was once a time when I didn’t have many thoughts or feelings about God as great physician, but now I have prayed to that God with Carolanne, whose husband is pinned down by Parkinson’s, and Belle, who so much wants to keep this pregnancy, and Albert, who is dogged by depression, and because of those prayers, and the fears and hopes and miracles and disappointments they carry, God-as-physician seems a richer image than I first understood. Yet the repetition of familiar images can have the opposite effect. The words become placeholders, and I can speak them so inattentively that I let them obscure the reality whose place they hold. I repeat them, I restrict my prayer to that small cupful of images, and I wind up insensible to them. Unlike my church, with its four favored metaphors, the Bible offers hundreds of images of God — images the church has paid a great deal of attention to in earlier centuries, although many are largely overlooked now. Drunkard. Beekeeper. Homeless man. Tree. 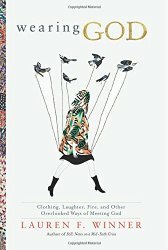 “Shepherd” and “light” are perfectly wonderful images, but in fixing on them — in fixing on any three or four primary metaphors for God — we have truncated our relationship with the divine, and we have cut ourselves off from the more voluble and variable witness of scriptures, which depict God as clothing. As fire. As comedian. Sleeper. Water. Dog. In this book, we will explore several overlooked biblical idioms for God. We will look at what the Bible itself suggests about these idioms, and what our daily lives have to say about them, and what various preachers and pray-ers and writers from earlier eras made of them. Your guide in this exploration is a bookworm who can happily get lost for a few days on a research trail, and I sometimes bring the words of anthropologists or historians or literary critics to bear on our ruminations. (Since the library of insights from those who have gone before us, and from contemporary scholars and preachers, is so rich, I have set additional gems at the bottoms of many pages. These quotations are there for stimulation and contemplation. Feel free to stop and linger over them, or skip them, or add your own musings.) Because I hope the book will help you sit down with God in a place the two of you have never visited before, each chapter concludes with a prayer. The final aim of this book is not to persuade you to stop thinking about God as your shepherd and start thinking about God as a cardigan sweater or One who weeps. The aim, rather, is to provoke your curiosity, and to inspire your imagination, and to invite you farther into your friendship with God. If that invitation sounds even a tiny bit enticing, I highly recommend that you spend some time with this book. Henry Holt and Company, New York, 2015. 44 pages. This nonfiction for early elementary age kids hits just the right note. A fly buzzes into a classroom and finds the kids studying — as usual — butterflies. Well, guess who else metamorphoses, can fly, and is beautiful (at least according to my mother). Here’s how the story goes: My 500 brothers and sisters and I started out as eggs. Our mom tucked us into a warm, smelly bed of dog doo. When we hatched, we looked like short, greasy white worms. In other words, much cuter than caterpillars. Scientists called us larvae. Humans called us maggots. Our parents called us adorable. He tells the kids all about the lifecycle of a fly and cool (or disgusting, depending on your viewpoint) facts about them as well. No. We don’t throw up on everything. Only solid foods. See, we don’t have any teeth, so we can’t chew. I had to throw up on this apple core to turn it into a liquid. That way I could sop it up with my spongy mouth. But if something’s already a liquid, like the soup you’re having for lunch, I don’t throw up on it. I’ll slurp that right out of the bowl. Of course, when the kids decide the fly is right and he should be studied, he finds he doesn’t actually want to be kept in a cage in the classroom. Then he tells them the facts about diseases flies carry so they’ll let him go. 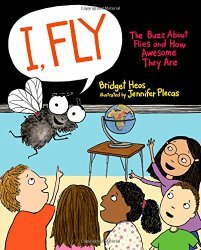 Fortunately, readers of this book can learn all the facts the friendly fly has to tell them without making contact with its germs. This one’s a natural for booktalking in the schools. Children will learn fly facts without even trying. You are currently browsing the Sonderbooks blog archives for July, 2015.